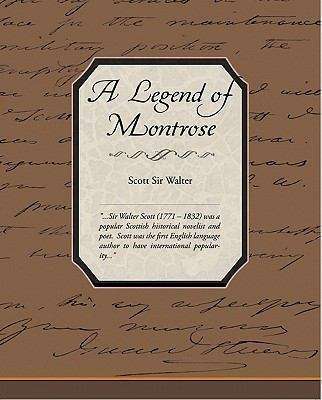 A Legend of Montrose is an historical novel by Sir Walter Scott, set in Scotland in the 1640s during the Civil War. It forms, along with The Bride of Lammermoor, the 3rd series of Scott's Tales of My Landlord. The two novels were published together in 1819. The story takes place during the Earl of Montrose's 1644-5 Highland campaign on behalf of King Charles I against the Covenanters who had sided with the English Parliament in the English Civil War. The main plot concerns a love triangle between Allan M'Aulay, his friend the Earl of Menteith, and Annot Lyle. Annot is a young woman who has been brought up by the M'Aulays since being captured as a girl during a blood feud against the MacEagh clan (also known as the Children of the Mist). M'Aulay and Menteith are both members of Montrose's army. Annot eventually marries Menteith after it is discovered that she has aristocratic blood, and was kidnapped by the MacEaghs as a baby. This leads to the jealous M'Aulay stabbing Menteith and then fleeing Montrose's army. Menteith survives whilst M'Aulay disappears and is rumoured to have been killed by the MacEaghs. Much of the novel is taken up with a subplot involving an expedition into enemy territory by Dugald Dalgetty, an experienced mercenary fighting for Montrose. Dalgetty does not fight out of political or religious conviction, but purely for the love of carnage. However, he is very professional, and remains loyal to an employer to the end of his contract. He gained his experience fighting for various armies during the Thirty Years' War, then still raging in Germany. Note: He did not fight all thirty years. Dalgetty is regarded as one of Scott's finest comic characters, however he dominates so much of the story that the main plot is not really developed in detail.